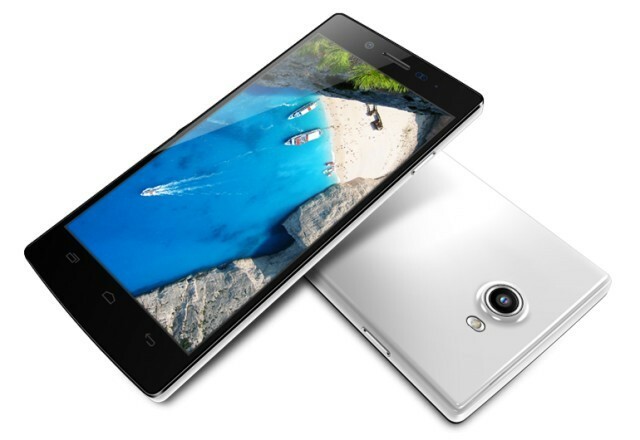 iOcean is a smartphone manufacturer from Shenzhen, People’s Republic of China. The company iOcean was founded in December 2008 and is specialized in the European market. This year iOcean has had a somewhat slow start, because, after a few updates to the X7, it happened months until the X8 appeared on the market, and the Chinese manufacturer has prepared an interesting version of its latest model. Two versions will be, one equipped with a quad-core processor, and a more advanced, that comes with the Pro as a distinctive name, and we are going to review and compare the models iOcean X8 Mini Pro, iOcean X8 Mini and iOcean X8. Also, you can find more information here, in 1949deal.com. The new model is based on the design of its bigger brother, the X8, but with a significant reduction in size, it has a 5-inch screen and hardware that has nothing to envy the flagship iOcean. The configuration of iOcean X8 Mini Pro is quite complete. A good alternative to powerful X8. The display is a panel LTPS of 5-inch, instead of the 5.7-inch of the X8, a significant reduction in size, but a hardware that has nothing to envy the flagship iOcean. This also takes a step back in resolution, iOcean X8 Mini Pro has a octa-core MediaTek MT6592 at 1.7 GHz processor, 2 GB of RAM, 32 GB of internal storage and Android OS 4.4 KitKat, while the main differences are the screen resolution, which is reduced to 720p HD, a 2200 mAh battery and two cameras, which in this case will be 8 megapixel rear and 2 megapixel front. The result will be a smartphone constructed of glass, like the Oppo R1, which provides a good power in only 7.6 millimeters thick. It could actually be one of the best alternatives of the Chinese market. In short, this iOcean X8 Mini Pro is virtually identical in all respects to the original version of 5.7 inches, only a 5-inch screen and a smaller more compact dimensions. It has also been cut to their specifications in some sections, but still remains an octa-core high-end model very interesting. What means that it is a powerful smartphone, able to provide a good performance for a conventional use of the device. 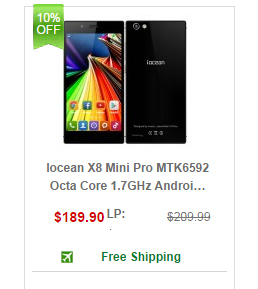 You can find the iOcean X8 Mini Pro in 1949deal.com for just $189.90, in black. Free Shipping. iOcean X8 Mini is one of the last smartphone created by the Chinese iOcean, famous for having excellent high performance smartphones at low prices. If you love the design of the iOcean X8, but its size with the 5.7 inch screen you think is a bit big, this IOcean X8 Mini may be the model that you are looking for, so do not stop reading all the specifications that have this attractive new smartphone. In terms of design, the mini IOcean X8 be virtually identical to the original phablet in which it is based, but of course, will have a smaller size that is placed in 142 x 70.1 x 7.6 mm. The iOcean X8 Mini is made of a single metal body with a glass rear protected with Gorilla Glass 3. This design breaks previously seen and forms a sober smartphone, durable and elegant and it has the same display as the iOcean X8 Mini Pro. 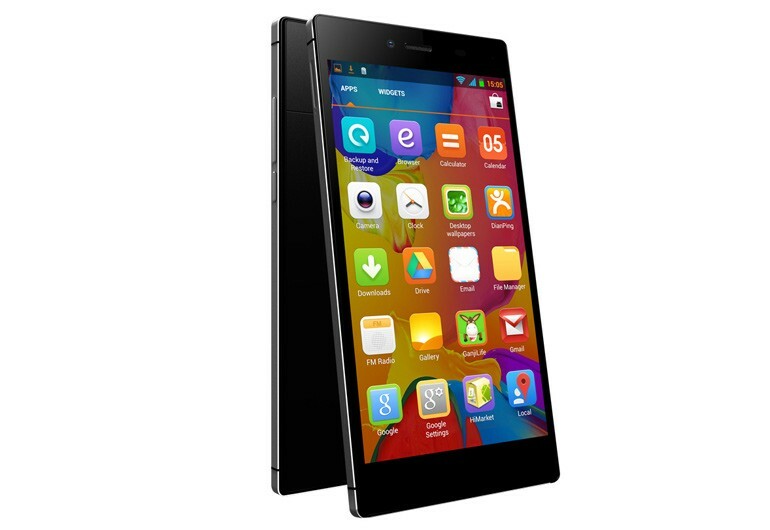 Another major change is in its raw power, becoming a Mediatek MT6582 Quad-Core 1.3 GHz processor and 1 GB of RAM. Features, that put this iOcean X8 Mini as a model to be considered in the average range. It can run any application, incorporating Android OS 4.4 (Kit Kat), the latest version of Android that allows you to access to multiple applications in Play Store. For this version of iOcean X8 Mini, it has a CMOS sensor of 13 megapixel with BSI technology, which stands for Back Iluminated Sensor, a technology that uses a new arrangement of the internal elements of the camera to capture images with greater brightness even in low light conditions. The secondary camera is 5 megapixel, so you will not have trouble making video or some other Selfie. 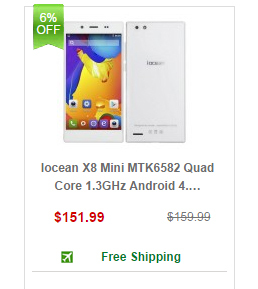 You can find iOcean X8 Mini in 1949deal.com for only $151.99 in black and white. Free Shipping. The iOcean X8 is undoubtedly one of the most beautiful phones on the market today and since it brought our attention thanks to its great design which features glass Gorilla Glass on both sides, a very slim profile and a metal frame of high quality. 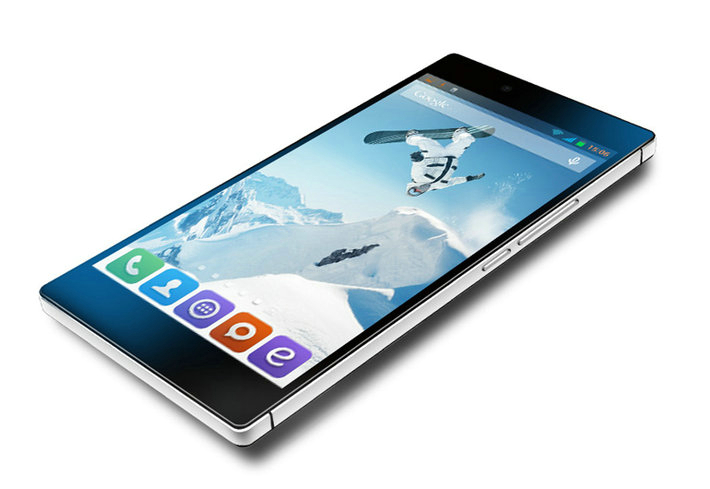 Also, its design can be a great attraction for many users seeking a stylish phone. It is a big phone but is quite comfortable to use, a success put volume and power buttons together as a single finger can interact with them. It measures 160 x 79 x 8 mm and weighing 172 grams. The display of 5.7 inch and it features a LTPS OGS Full HD technology, it has an amazing quality thanks to being LTPS, get a better viewing angle and better density per inch, this technology is similar to the Retina Apple. It has a very good tactile response being ultra sensitive, you can use with gloves and even with wet hands. As already mentioned, the screen is also protected with Gorilla Glass 3, a normal thing since this gem screen has to work as secure as possible. Its characteristics are reflected in practice with a very good quality, the colors are very vivid and crisp, perfect viewing angle can reach almost to 180 without any problems. The quality of video games or watching videos is also excellent, providing a very pleasant experience, this is thanks in part to the ClearMotion technology, incorporating improved fluency and quality videos. Inside the iOcean X8 it features Mediatek MT6592 eight-core 1.7 GHz processor and GPU Mali 450 MP4, basically the best you can find in China, with an already proven and coming close to Qualcomm processors. Also with 2 GB of RAM. Its performance is excellent as all Chinese phones tested with this processor, you will have a phone for years as there is no application or game that the MT6592 cannot move with complete fluency, plus its 2 GB of RAM will make the iOcean X8 further is vented. Battery consumption was not excessively high but keep in mind that a 5.7-inch screen with full HD resolution consumes more than normal and with domestic battery 2650 mAh. Connectivity of the iOcean X8 in is very complete, it has Dual SIM (micro and nano SIM), 2G: GSM 850/900/1800/1900 MHz, 3G: 900/2100 MHz, GPS and A-GPS, Wifi 802.11 b / g / n Dual Band (2.4 and 5 GHz), Bluetooth 4.0, FM Radio, NFC and OTG. 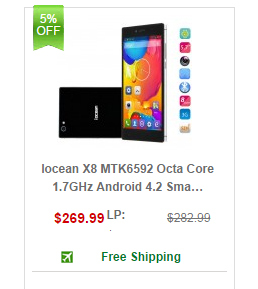 You can find iOcean X8 in 1949deal.com for only $269.99 in black. Free Shipping. If you are looking for a phone that has most of its specifications located in the high/middle range but nevertheless have a very affordable price, iOcean X8 Mini Pro, iOcean X8 Mini and iOcean X8 may be the ideal models for you. So if you like these phones, you can buy them in 1949deal.com for a price of only $189.90, $151.99 and $269.99, just by clicking on the images that you have just below.